In this project we explored the truth of war through various sources, such as documentaries, news articles and a veteran guest speaker who shared his experiences. We also read about about soldiers’ war experiences, from multiple soldiers, called “The Things They Carried,” by Tim O’Brien. Then we put that research into our art to display. My art piece was oragami that represented military vehicles, and I learned how to master the art of origami. I improved my origami skills by trying and refining your folding and technique. I also strengthened my research skills by finding information about military vehicles and the history of origami. The hardest part of this project was folding the pieces themselves from scratch. I believe that finding mistakes we made during war is crucial for the future, because we as a nation can’t make the same mistakes twice. For example, making nuclear weapons to threaten other countries was a terrible mistake. Mass producing military vehicles and such was another error. As a result, more countries targeted us and felt challenged by us. Some people go into war without knowing the actual risks of fighting. 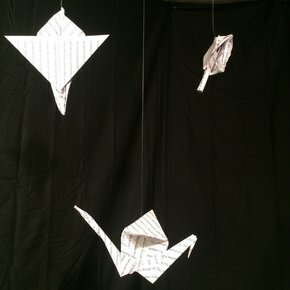 My artwork is origami representations of a F-15 VTOL military jet, a M1 fighter tank, and a traditional Japanese crane. They are folded out of paper printed with facts from Wikipedia about the military technology and the history of origami, respectively. The military is proving that they can make a machine of war much faster and easier than a simple symbol of peace which is represented in my project by the origami crane. I’ve amplified this thought by folding up the facts and specifications of each weapon so that the power of the weapon no longer is important, it’s the beautiful piece art that matters. I chose these specific military machines because they are often found on the front lines of battle- and usually the first things to go as well. I think that the origami looks really cool with the text all manipulated by the folds, and I was really proud of myself for coming up with the idea. I looked up origami tutorials on YouTube and learned and refined the folds and steps to accurately reproduce them. Then, I researched the M1 and the F-15, compiled lists of facts, and printed them out. Once I had my facts, I went about folding. I learned a lot about the machinery and Japanese culture. I feel very positively about Japanese culture and think that it’s very interesting, civil, and well-rounded. I like how the origami cranes are symbols of peace and respect, and that they make cranes to place on the graves of those who have passed away as signs of respect and well-wishes. I was surprised at how difficult origami is. I had to go through a long period of refinement and threw away many pieces after incorrect or messy folds, or when I tried to use construction paper which was too thick to fold well. I think that I’ve found a new hobby, and am made very happy by the slow, steady process of making origami. Reflection Prompts1: What did we do for this project?For this project we made a mock trial on a book called Things Fall Apart where the people of Umuofia are accusing the British Empire for Okonkwo's death. 2: What role did you play in the trial? I played the role of one of Okonkwo’s friends, Obierika. For the role, I had to talk about my encounters with Okonkwo in the past, and then be questioned by the lawyers. I had to know Obierika’s history and interactions with Okonkwo which meant that I had to have knowledge about the book and its plot and what happened. I was proud of my testimony when I wrote an affidavit with Sadie. An affidavit is what happened, what your interactions were, and basically just explaining the background story. 3: How did you strengthen your skills during this project? I practiced speaking with others, and writing the affidavit made my skills grow. I was challenged by the amount of research I had to do on the novel. I had to look everywhere for evidence and proof, which was hard. I’m proud of the research I did, and my going up to the stand to speak. I was proud of how I performed and played that character in front of a lot of people. 4: What enduring understandings will you take away from this project? I’ve learned a lot about Imperialism and the history of Africa and cultures. The way that I think about history has changed, too. I thought that back then everyone was a savage but I didn’t know that people back then were so bent on a “perfect” society. Justice and law are different for each culture. Some laws are stranger than others, and some people don’t always like the laws they have. We asked questions about areas in our community and reported on them. Lucas and I asked questions of people at the skatepark in order to gather information. Since there is no information online about the owner of the property, we had to do more searching than we thought we would have to. We built background knowledge I have friends that skateboard and we already knew things about skateboarding, so we used that knowledge to build on. We had to do some searching about DIY skateparks and I was astounded by the time and effort that people are willing to spend on something that they love. The construction of the DIY park itself was pretty shocking, too. Making concrete smooth and ridable is really difficult and takes a lot of time. Not to mention building ramps and rails and the planning that goes into making a functioning skatepark. We prepared by researching DIY parks and the materials that are most often used to make them. While researching, we learned about the cost of constructing a proper skatepark, as well as stumbling upon a newspaper article in Detroit that reported on a few teenagers busted for making a park in a supposedly abandoned parking lot. I learned that bias is bad for people who want to know facts. The news should be more about fact and less about opinion. I learned that it’s difficult to be unbiased, but I don’t really know how you avoid it. Normally when I’m telling people things, I don’t mix my opinion in there, and I also don’t lie to people about things that happen. I believe do over don’t “If your first attempt is your last then you will never find success” so basically what i’m trying to say is a “all progress is good progress” and “work hard to achieve hard” sorta meme. But that doesn't mean you are better than someone, you should just feel good about yourself because you did greatness. A few months ago I decided to go to durango cross fitness, well not really, my mother said “it would be good for you” and “you would look good just in time for school” and other things like that. On my first day I had to do endurance tests were I had to do everything but stop. But all i did was stop and take breaks.I was weak, I felt like throwing up, I wanted to quit so badly, but then the coach said to me: “don’t worry, everyone started here in your shoes, if you come here and do your best then you will do better tomorrow without even knowing it!” little did i know she was right. I went there every tuesday and thursday always doing more work than the last time I went to the gym. if you were doing your best yesterday and you do half of your best today GOOD, you did some progress rather than giving up on your goal. i. "This I Believe" is a project about stating a claim about a belief that is true and applies to daily life. ii. To express one's self through prose and stories. iii. I prepared by doing writing exercises with my class and looking at others' "This I Believe" essays. iv. An essay and podcast. i. Recording it. I had tons of technical difficulties. ii. Some of my homophones are confused. I could get better at those. iii. Change everything. Make it longer, maybe. and select a different "This I Believe" statement to "Family Matters" or something like that. i. I enjoyed reflecting on myself. ii. None. I cringed halfway through writing it. i. I don't believe in beliefs- whatever that means. ii. People believe in different things and we shoudn't laugh at them for their beliefs. iii. Sharing my beliefs felt embarrassing and I cringed a lot.